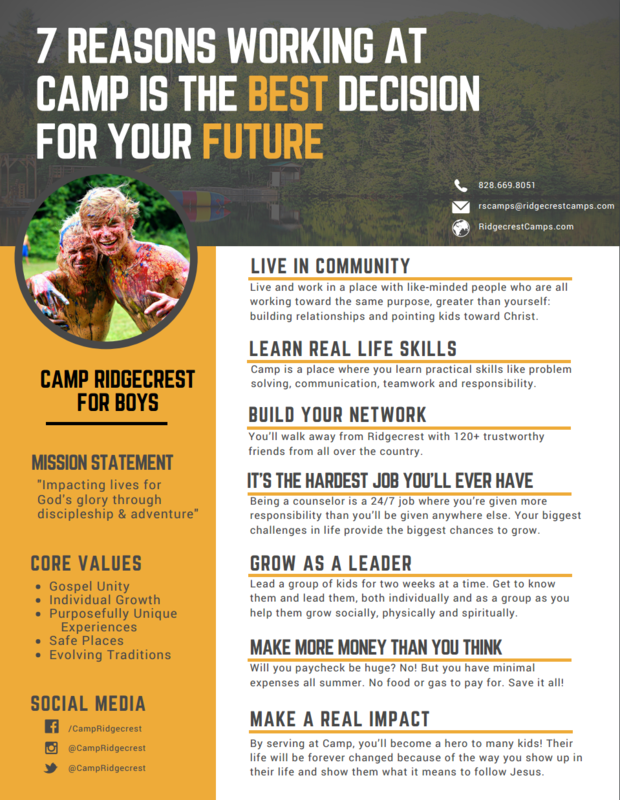 Why Work at Ridgecrest Christian Summer Camps? To download the PDF above, click here: 7 Reasons Working at Camp is the BEST Decision for your Future. Your faith will be strengthened while at camp. From worship to teaching, from staff Bible studies to leading devotions with campers, you are sure to grow in your relationship with Christ and grow as a spiritual leader. You will communicate with people of all ages; giving clear instruction, listening, learning patience. You will also provide written feedback with parent's on each child's progress while at camp. Staff plan activity teaching and learn how to prioritize responsibilities. You will help campers get places on-time and in good spirits. You will supervise campers in different activities and in the cabin. Parents are placing their most precious possession in your care, and you are exceeding their expectations in leadership. Staff also nurture an environment that encourages cooperation, growth, and full participation. Staff pull a team (cabin) together each day in camp life. You will also work collaboratively with other staff, developing strong relationships. Each counselor functions as a coach within the camp schedule through encouragement and fun! You will learn the art of negotiating as you work with campers to build community. Our staff play a vital role in bringing consensus to diverse groups. Motivating and creating a fun environment sometimes requires a little bit of abstract thinking. What a great place to learn more about your own gifts of creativity! You will build relationships with staff from all parts of the country. You will also benefit through becoming part of each camp's Alumni/Alumnae associations, which boasts thousands of members! Learn more great reasons to work at camp by checking out our Benefits section. If you're already sold, click on How to Apply to investigate the path to an unbelievable summer adventure.